GLENN D. SUTHERLAND, Ph.D., R.P.Bio. overseas project and training experience, including work in Thailand, Vietnam, and Fiji. Glenn is a systems ecologist with extensive experience in spatial landscape and habitat modeling, endangered species conservation, and scenario analysis to resolve forest management issues. 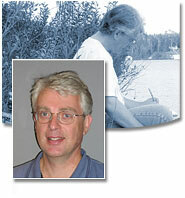 Glenn has provided scientific analysis and modeling support to several multi-stakeholder land-use planning processes, including the North Coast Land and Resource Management Planning Table, the Coast Information Team, the Canadian Marbled Murrelet Recovery Team, and the Canadian Spotted Owl Recovery Team. He has co-developed spatially explicit simulation models of habitat management and population dynamics for several species at risk, including the Northern Spotted Owl, northern caribou, and the coastal tailed frog. He has also designed and analyzed ecological representation problems at the multi-tenure (regional) and single tenure (licensee) scale.